joy | In Domino Spera! Ps 24 R/. The Lord of hosts, he is the king of glory! In the Catholic order of books in the Old Testament Malachi is the last book because of his direct prophecies to the coming Messiah. What we hear from him today is precisely one of those prophecies: See, I am sending my messenger … and the Lord whom you seek will suddenly come to his temple. The messenger of the covenant in whom you delight — indeed, he is coming (Mal 3:1). Through his prophecy, Malachi is pointing us to the birth of Christ, to the Nativity, which we celebrated just 40 days ago. And he speaks of Jesus as being a refiner, one who purifies, who separates the dross from what is precious. In other words, Jesus’ mission will be one of division: He will separate what is bad from what is good: But who can endure the day of his coming, and who can stand when he appears? For he is like a refiner’s fire…; he will sit as a refiner and purifier of silver, and he will purify the descendants of Levi and refine them like gold and silver (Mal 3:2-3). And it didn’t take long for this to happen: remember the contrast between the Magi and Herod? Because the Magi were seeking the light of righteousness and truth, they were able to rejoice in the birth of Jesus. Herod, on the other hand, because he loved the darkness of pride and power, feared Jesus and sought to kill Him (cf. Mt 2). 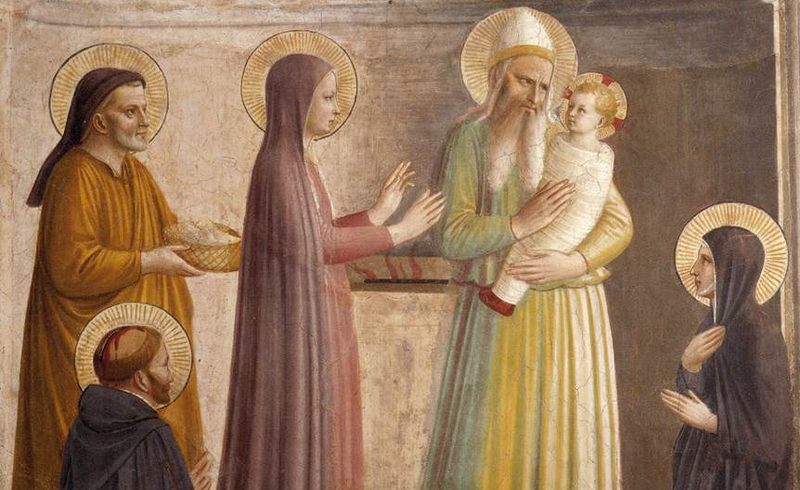 And it’s this same theme of division and purification that Simeon takes up in his prophecy: This child is destined for the falling and the rising of many in Israel, and to be a sign that will be opposed so that the inner thoughts of many will be revealed (Lk 2:34-35). The Gospels are full of accounts that Jesus was loved by some and rejected by others. The humble and lowly, the poor and needy, the weak and downtrodden… those who acknowledged their need for salvation recognised Jesus and rejoiced in His mercy and love. But the proud, the arrogant, the rebellious, the selfish, the greedy… those who sought themselves rejected Jesus and feared His words. This child is destined for the falling and the rising of many (Lk 2:34). My brothers and sisters, this dynamic continues even today! Every time we meet Jesus — whether in prayer, in that whisper that calls us to do something or avoid something, in Scripture, in Church teaching… Every time we meet Jesus, we’re confronted by this reality of falling and rising. And every time, we’re confronted we will either rejoice or fear; there’s no other option, only joy or fear. We’ll either embrace God’s presence and rejoice in His mercy and forgiveness, or we’ll turn away in fear of His judgement. Now you might think this sounds a bit dramatic, but it’s a profound reality of our spiritual life. Everyday, we’re confronted by Jesus — often in small little ways we don’t always notice —, and how we respond to these encounters with Jesus will either bring us closer to Him or further away from Him. When we sense that we ought to pray but avoid it to do something else, we say ‘no’ and we turn away from Jesus. When our conscience tells us not to do something but we do it anyway, we turn away from Jesus. When we respond in pride and anger instead of patience and love, we turn away from Jesus. Every time we say ‘no’, no matter how small, we turn away from Jesus. But inversely, when we take the time to thank Jesus because we just missed an accident, we grow closer to Him. When we make efforts to be patient with someone who’s slow, we grow closer to Jesus. When we decide to fast from something we enjoy in order to discipline our desires, we grow closer to Jesus. When we do something we don’t want to but because someone needs it, we grow closer to Jesus. When we share what we need with those need who need it more, we grow closer to Jesus. Every time we say ‘yes’ to Jesus, no matter how small, we grow closer to Him. If you listened carefully to these examples, you’ll have noticed that in both responses (turning away or growing closer) there’s suffering. When we turn away from Jesus we suffer the torments of sin; that’s pretty obvious. But did you know that when we turn to Jesus we also suffer? That’s the image of the refiner Malachi was using. Just like precious minerals are purified by fire to reveal their value and beauty, so to are we purified by fire, the fire of divine Love. That’s why the image of the Sacred Heart has flames on top of it: Jesus’ love for us burns within Him like a fiery furnace, and when we embrace it, it burns away from us all that’s impure, all that’s not like Jesus. And while this is really a spiritual analogy, at times it is painful. We need only look to the Saints to see this. But we mustn’t be afraid of this purifying suffering, because when we do look at the Saints, we also see that those who embrace Jesus’ purifying love are also filled with joy, because though purification can be painful, it always works for our good, for our intimacy with Jesus, for our sanctification. Even Jesus had to go through this. That’s why today’s prophecies also point us to the future: to the Cross. As the letter to the Hebrews says, Although he was a Son, he learned obedience through what he suffered; and having been made perfect, he became the source of eternal salvation for all who obey him (Heb 5:8-9). And, It was fitting that God…, in bringing many sons and daughters to glory, should make the pioneer of their salvation perfect through sufferings (Heb 2:10). By denying His own will for the sake of the Father’s will, Jesus shows us the way to perfection, and this perfection reaches its high point on the Cross, as Jesus gives Himself entirely over to the Father. But it’s only because of the Cross that we have the Resurrection. New life can only be received once we’ve allowed our ‘old life’ to die on the Cross. By embracing the purifying love of Jesus, by allowing Him to change our hearts and habits — as painful as that might be —, we’re able experience even on this side of Heaven the life of the resurrection. We need only abandon ourselves to Jesus and His will, and to trust that Because he himself was tested by what he suffered, he is able to help those who are being tested (Heb 2:18). So it’s not by accident that Blessed Pope John Paul II joined to the Feast of the Presentation of the Lord the World Day for Consecrated Life, because like Christ, consecrated men and women, through their consecration, dedicate their lives to the pursuit of the purifying love of Jesus. And so, as we rejoice today that the Lord has entered His Temple — and He entered the Temple of our hearts at Baptism —, may we praise Him and rejoice in His mercy, so as to entrust ourselves to Him and be purified by His burning love. Amen. When I was a young boy, we had a series of little comic books about the Bible — now you can get them in one volume, called the Action Bible. My brothers and I would read these little books all the time. It’s actually the way I learned all my Bible stories, and I still remember them today because of that. But there was always one New Testament passage that got my attention over and over again: Man in a Tree. You see, I was a small short kid, so I completely identified with Zacchaeus not being able to see Jesus over the crowd. 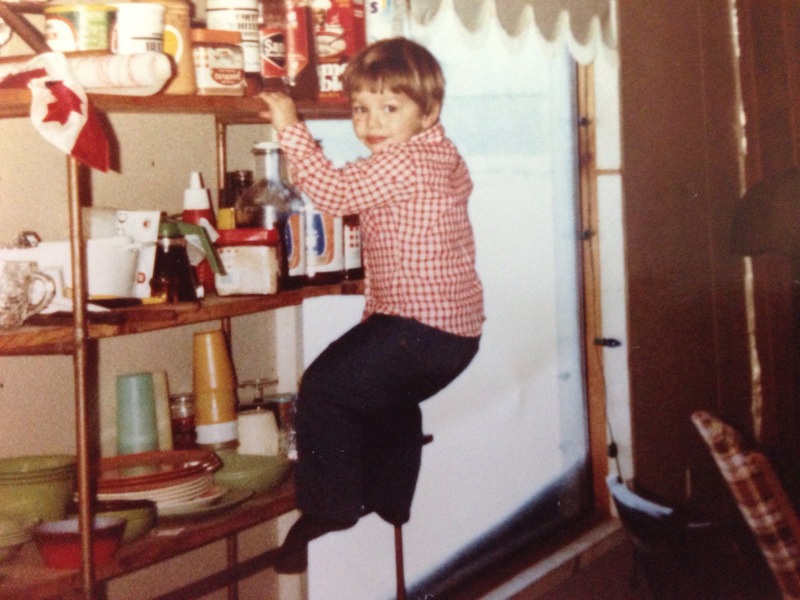 I also loved to climb things: trees, sheds, bookcases, scaffolding, houses… So this story about a short man in a tree captivated me, and I’ve always had a soft spot for Zacchaeus. As I grew up, other aspects of this passage came to life for me. I realised that Jesus called Zacchaeus by name the first time He spoke to him. It’s as if Jesus already knew him. Then, the math didn’t make any sense to me: half of my possessions, Lord, I will give to the poor; and if I’ve defrauded anyone … I will pay back four times as much (v. 8). Either he was a good investor or a bad counter, because giving back four times what he took with only half of his money left…? It just didn’t add up for me. But as I began to study Scripture in the seminary, this passage, and many others like it, began to open up to a deeper content. Now, it’s not that there was anything hidden in the story; it’s all completely visible, I just didn’t know to see it. You see — and I’ve said this several times already since I’ve been here —, Bible passages must always be read within their context: the immediate context of the chapter and the specific book, but also in their wider context of the whole Bible. And for Zacchaeus’ story, this give us so much! By this time in Luke’s Gospel, Jesus is on His final journey to Jerusalem where He will be crucified. He knows this very clearly, because He’s already talked to His disciples about it three times (Lk 9:22; 9:44; 18:31-33). And the closer He gets to Jerusalem, the stronger His language becomes. In the paragraph before today’s story, Jesus arrived at Jericho (Zacchaeus’ town) and He healed a blind man who had been crying out: Jesus, son of David, have mercy on me! (Lk 18:38). You probably remember the story. Now a crowd had already been following Jesus, but now with the healing, you can imagine the crowd got bigger. And this is where we meet Zacchaeus. Zacchaeus may already have heard about Jesus before, but Luke gives us the impression that he certainly heard about the healing: He was trying to see who Jesus was (v. 3). Zacchaeus’ interest was piqued by what he had heard about Jesus, and he wanted to know who this man was, who could heal the blind. And clearly his curiosity was quite strong; it’s not everyday that an adult would run ahead and climb a tree (cf. v. 4) to see who’s passing by. Now that’s just Zacchaeus’ actions. Jesus’ actions are all the more powerful! Notice how Jesus calls him by name: Zacchaeus, hurry and come down (v. 5). Again, Jesus looked at him with the heart of God, and loved him. That’s why he then proceeded, not to condemn him for being a sinner, a tax-collector, but rather welcomed him and invited Himself over: I must stay at your house today (v. 5). Zacchaeus met Jesus, and Jesus welcomed him; Jesus accepted Zacchaeus and loved him despite his sins. Think on that for a minute! Whereas the crowd grumbled and rejected Zacchaeus, Jesus accepted and loved him despite his sins. No wonder Zacchaeus got so excited and generous in his response! See what love does! See what God’s grace does to the sinner! That’s why Jesus said he came to seek out and to save the lost (Lk 19:10). Love brings to conversion when it’s encountered. Jesus welcomed Zacchaeus, whom He already loved; and Zacchaeus, through that loving welcome, encountered the generous love of God, and immediately repented of his sins and changed his life. That’s why Jesus was able to say: Today, salvation has come to this house (v. 9). Encountering Jesus Christ brings with it conversion; repentance brings with it salvation. This is the beautiful gift that our Lord came to bring us! This is the Good News! Encounter with Christ is why we have the Sacraments, especially the Eucharist; it’s why we have so much Scripture at Mass; it’s why we really do need to daily spend time in prayer. Repentance is why we acknowledging our sins by beginning each Mass with the Penitential Act; it’s why we have Confession. And we gather for the Eucharist as a community so that we may also encounter Jesus in and through each other. All of this works for our salvation. But we also need to become ‘encounters’ for others. How many people do you think Zacchaeus told about his meeting with Jesus? How many people do you think he told about having Him over as a houseguest? We too need to talk about our faith, but not so much about the doctrines of our faith. As Pope Francis recently said, doctrine doesn’t make sense without knowing Christ (“Interview with Pope Francis”, La Repubblica, 9 October 2013). Rather, we need to talk about the experiences we’ve had of Christ, who continues to welcome us and work in us. This is our mission as disciples: to share the encounter we’ve had of Jesus with everyone around us. But to do this, we must imitate Jesus: we are not to condemn the sinner, but to welcome and love him. Now that doesn’t mean we put up with sin; but we do put up with people, people who are loved by God, and so should be loved by us also. Who knows what that Love will do? Who knows what that encounter with Jesus will do in their hearts? Maybe, like Zacchaeus, they too will repent and respond with a generous love for God. Amen. Ps 24 R/. Lord, this is the company of those who seek your face. Lord, this is the company of those who seek your face (Psalm refrain). My brothers and sisters, this is the joy that we celebrate today: the joy of our brothers and sisters who have sought the face of Christ, and who contemplate it day and night in His presence, for today, Solemnity of All Saints, is the feast of all who are in Heaven, whether canonised or not. And we rejoice for two reasons: first, because the ‘saints’ now share in the blessed life that was promised them in Baptism — what we call the ‘beatific vision’ —, and [stand] before the throne and before the Lamb (Rev 7:9) seeing God as He is (1 Jn 3:2). And as St. Paul reminds us, we are to rejoice with those who rejoice (Rm 12:15). Second, we rejoice because their reality is our calling! We, too, as children baptised into Christ have been given the same promise, and we ought to anticipate it with eagerness and joy. 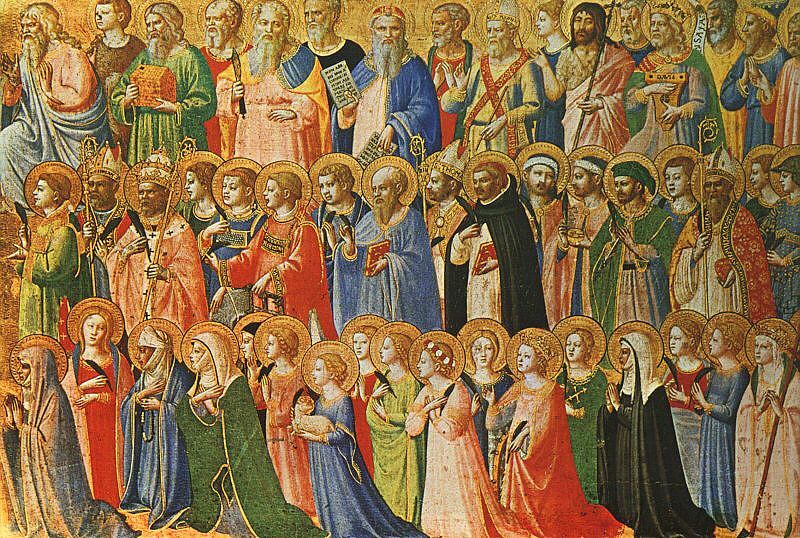 The Solemnity of All Saints reminds us that this is what awaits us if we’re faithful to Christ. And the great multitude that no one [can] count (Rev 7:9) that St. John describes, should strengthen our confidence and our hope that we too can be numbered among them! For what they now possess, we hope to have also. And yet, this hope (of joining the saints in Heaven) isn’t just a hope for the future. In a very real way — though limited and only partial (incomplete) —, we already share in their joy and reward, because we already share the same life that flows in them. This is the mystery of the Communion of the Saints: by God’s grace, through Baptism we already share with them in the divine life here and now. What we hope for, what we await, is nothing more than the completion of what has already begun in us. That’s why in the second reading St. John says, Beloved, we are God’s children now; what we shall be has not yet been revealed. What we do know is this: […] we shall be like Him, for we will see Him as He is (1 Jn 3:2). Pope Francis spoke of this reality just the other day in Wednesday’s General Audience (30 October 2013). He spoke about how this sharing already now in the same bonds of Baptism — first with Christ, and through Him, also with each other — is rooted in Christ’s prayer: that they may all be one. As you, Father, are in me and I am in you, may they also be in us (Jn 17:21). As a consequence, then, “the Church in her most profound truth, is communion with God, […] which extends to brotherly communion” (Pope Francis, General Audience, 30 October 2013). He goes on to say that this reality of communion means that we’re not alone in our faith; that we don’t journey alone; that we’re called to depend and rely on each other in our weakness. This should be a consolation for us! And it should be a source of joy! The joy of having so many baptised brothers and sisters who are journeying with, sustaining us by their prayers and company; and so many who have already reached the goal of Heaven, sustaining us by their prayers and example (Pope Francis). My brothers and sisters, we are not alone in the faith; we are not alone in the journey toward Christ, and this journey is not an impossible one! We are in the company of those who seek the face of God; we are in the company of a God who seeks us. And today’s Solemnity is a reminder that this is the glory to which we are called, and that if we abandon ourselves to God’s grace and mercy, that if we’re faithful to His love like the saints who’ve gone before us, then we too will receive the reward of the beatific vision, of eternal life in the presence of the very God who loves and saves us. May we be encouraged by the great multitude to constantly turn back tow God and be sanctified by Him. All you holy men and women, pray for us! Amen.